The beach near Glacis on Mahé is a rather small one and hardly used by tourists. There are a few fishermen with their fishing huts using the beach and there is plenty of shadow around. 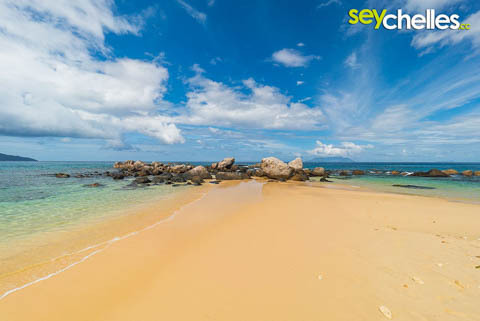 The northern end of the beach has an interesting yellow colour and is quite attractive with many different sized granite boulders in the water. This area is also pretty nice to go swimming. Unfortunately, there are a few walls that protect some properties from erosion that are a little distracting.